[C]ould I begin by again affirming the strength of this important bilateral relationship. A 60th anniversary celebration is important because it causes us to reflect on what we have done together and what we resolve to do together in the future. 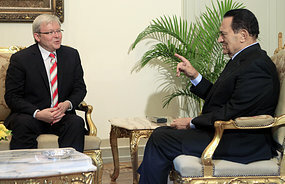 Australia has friendly and positive relations with Egypt, underpinned by strong people-to-people links. Trade, particularly in agriculture and resources, has long been an important aspect of the bilateral relationship. Australia works constructively with Egypt on international security issues including counter-terrorism, disarmament and the prevention of the proliferation of weapons of mass destruction. In other words, Australia is a not unimportant Egyptian ally. Given that, why has the Gillard government said nothing about the Egyptian regime shooting down its own citizens in the streets? Will the Australian government side with the people or the dictatorship? This is exactly what we should be drawing attention to now. Thanks for the post. Thanks Jeff for the reminder of the role Australia plays in supporting/sanctioning these sort regimes. Dictatorships and despots stay in power not just because of power, corruption and iron-fisted rule but because western democracies including Australia provide recognition and moral support that gives these regimes the legitimacy they seek. Allies, it seems, are allowed to get away with murder. NEWSREADER: Mr Rudd if I can turn now to what is happening there and what you see as the future, do you think the people – they’re calling for freedoms. They want more freedoms in their country. What’s Australia’s view on that? Do we support that? KEVIN RUDD: Well the political situation is highly fluid, as a number of my colleagues from elsewhere around the world have said. We have long supported democratic transformation across the Middle East. We have equally strongly argued that this transformation should occur peacefully and without violence. That remains our view in terms of recent developments in Egypt as well. I should add to what I just said before that earlier today I met with and had discussions with the Foreign Minister of Egypt in Addis Ababa, where we were both attending the African Union Summit and we discussed these matters in some detail there as well. NEWSREADER: The White House is suggesting that the Egyptians turn the internet back on and the social networks, that sort of thing, and of course to end the violence. You’d be supportive of that, would you? KEVIN RUDD: Well I’ve not seen White House statements to that effect. I go back to what I said before. We ourselves have long supported democratic transformation across the Middle East and across the Arab world, but equally we strongly emphasise the importance for those things to occur peacefully and without violence. Therefore we should be exceptionally vigilant about what is occurring in Egypt at the moment. And again I go back to my earlier remarks, we must be first and foremost concerned, at times of great instability and violence on the streets in Cairo, about the well being of Australians. It strikes me that Australia is particularly obsequious when it comes to their relationships with other countries including those run by dictators. Yes, yes, the MOST important thing about the dissent in Egypt, the call for democracy, the courage of ordinary people to resist the might of US-backed military opposition dedicated to preserving the privilege of dictatorship is … the wellbeing of Australians. No doubt Mr Rudd ran as quickly as his legs could carry him to find out what Mr Obama had to say. Clare, you are so right on both counts. According to Richard Neville in Crikey, Omar Suleiman, who is supposed to be the frontrunner for next president, was personally involved in torturing Mamdouh Habib. In Egypt, where torture seems to be a Government sport, Habib was interrogated by the country’s Intelligence Director, General Omar Suleiman, whose is ranked second in power to President Hosni Mubarak. Back in 2001, Suleiman took a personal interest in anyone suspected of links with Al Qaeda. As Habib had visited Afghanistan shortly before 9/11, he was under suspicion. Suleiman slapped Habib’s face so hard, the blindfold was dislodged, revealing the torturer’s identity. According to his memoir, Habib was repeatedly zapped with high-voltage electricity, immersed in water up to his nostrils, beaten, his fingers were broken and he was hung from metal hooks. He was again interrogated by Omar Suleiman. To loosen Habib’s tongue, Suleiman ordered a guard to murder a gruesomely shackled Turkistan prisoner in front of Habib – and he did, with a vicious karate kick. Suleiman is expected to be the next President of Egypt. Great article over at ‘Unleashed’ Jeff. It’s amazing that we bomb some countries back to the stone age to remove dictatorial regimes and take tea with others. Is it drawing too long a bow to suggest that the international community’s response, or lack thereof, to what is happening in Egypt can be summed up in one word: Israel?